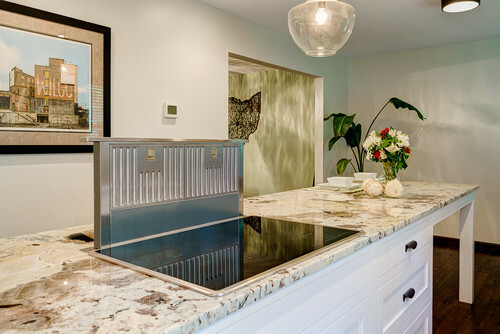 A range hood is a major architectural element in your kitchen, it represents a great opportunity to make a unique and impressive design statement or a simple and subtle look to support the overall style of your kitchen. There are so many potential hood styles, from oversized hoods to concealed hoods – the possibilities are endless, but its helpful to know some tips before making the final decision on your kitchen hood. It is important to understand that a range hood is still an appliance and its not just for decoration. The purpose of a kitchen hood is not only to properly clean the air while you cook, it can also provide extra lighting to the cooking area, it can aid in keeping your kitchen cleaner, it can reduce the risk of carbon monoxide poisoning, and it can help cool off the kitchen. By moving the smoke outside it’ll prevent the smoke from setting off your smoke detector unnecessarily. 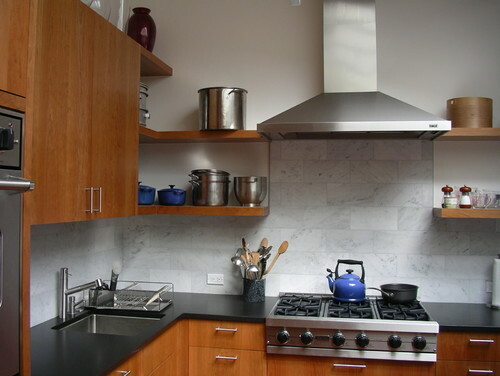 Even if you don’t cook all that often, having a range hood can increase your property value. When searching for a range hood, make sure to consider the blower size, and noise tolerance before selecting your range hood style. Once you have settled on the hood insert, then you can start playing with your hood design. There are different types of range hoods to choose from. Let’s explore the different types. Under cabinet range hoods are one of the most common types you’ll see. They’re an affordable choice that makes sense with many kitchen designs. The vent hood is installed under your cabinet and above your stove range. The photos below show an example of under cabinet range hoods. The first photo shows a typical under cabinet installation, the second is a more modern approach, making the hood almost invisible by integrating it within the cabinets. 3D Rendering of Kitchen Cabinets. Overlay Cabinets with Slab Top Drawers. Shaker Door/Drawer Fronts in Sherwin Williams Snowbound. Otherwise known as Chimney Hoods, are usually mounted on a wall where there are no cabinets above. They’re wider on the bottom, stretching the full length of the range but narrowing to the vent therefore resembling a Chimney. One example of this type of hood is an all-in-one hood such as a stainless-steel hood like the example shown below. Another type of chimney hood is an insert plus shell hood. This type of hood allows for more flexibility on what type of internal blower and power level you want and what type of external hood shell material you want, such as cooper, stone or wood to name a few examples. Below are shown a few examples of this type of hood. Inset Cabinets by Hardwood Creations. Slab Top Drawers by Hardwood Creations. Estrella Doors/Drawer Fronts by Decore-Ative Specialties. Paint: Benjamin Moore Chantilly Lace. This type of hood is very similar to a chimney hood, but it’s actually designed for installation in a space where there isn’t a wall to attach a hood to. This hood is typically used for ranges that are integrated within kitchen islands, instead of the vent connecting to ducts on the wall, it does so in the ceiling and vents out the smoke that way. These types of hoods are generally regarded as the least effective option but they’re handy for those who want their range hood to be hidden away when not in use. They’re connected to ducts beneath the floor in order to move the smoke and air out in a downward direction which can be more difficult to achieve. They’re a common choice for people with ranges integrated in an island who do not wish to invest on an island hood. Having the right range hood can save you from having to do more cleaning, keeping your kitchen from smelling, and ensuring you don’t have to open all the windows every time you cook to avoid setting off the fire alarm. It’s a worthwhile investment for anyone who aims to use their kitchen for cooking often – and isn’t that the whole point of a kitchen? At Hardwood Creations it is important for us to help our clients pick the right range hood for their kitchen. With the help of our designers we will guide you through the detailed selection process of all the exclusive design features and finishes to form your one-of-a-kind hood. Come and see us before you design your kitchen and we’ll be with you every step of the way.